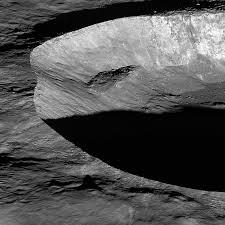 In 1976, the geologist Jack B. Hartung proposed that this described the formation of the moon crater Giordano Bruno. 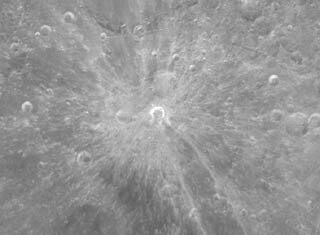 Giordano Bruno is a 22 km lunar impact crater on the far side of the Moon, just beyond the northeastern limb. At this location it lies in an area that can be viewed during a favorable libration (oscillation), although at such times the area is viewed from the side and not much detail can be seen. It lies between the craters Harkhebi to the northwest and Szilard to the southeast. When viewed from orbit, Giordano Bruno is at the center of a symmetrical ray system of ejecta that has a higher albedo (reflected light) than the surrounding surface. The ray material extends for over 150 kilometers and has not been significantly darkened by space erosion. Some of the ejecta appears to extend as far as the crater Boss, over 300 km to the northwest. 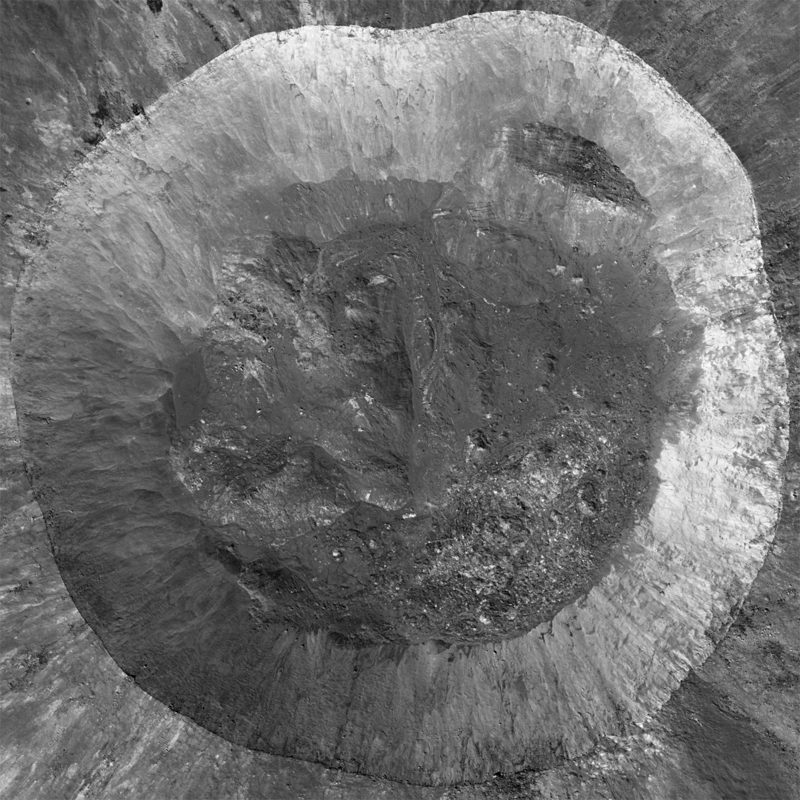 The outer rim of the crater is especially bright, compared to its surroundings. To all appearances this is a young formation that was created in the relatively recent past, geologically speaking. The actual age is unknown, but is estimated to be less than 350 million years. Beginning in 1593, Bruno was tried for heresy by the Roman Inquisition on charges including denial of several core Catholic doctrines (including the Trinity, the divinity of Christ, the virginity of Mary, and Transubstantiation). Bruno’s pantheism was also a matter of grave concern. The Inquisition found him guilty, and in 1600 he was burned at the stake in Rome’s Campo de’ Fiori. Modern theories predict that a (conjectural) asteroid or comet impact on the Moon would cause a plume of molten matter rising up from the surface, which is consistent with the monks’ description. In addition, the location recorded fits in well with the crater’s location. 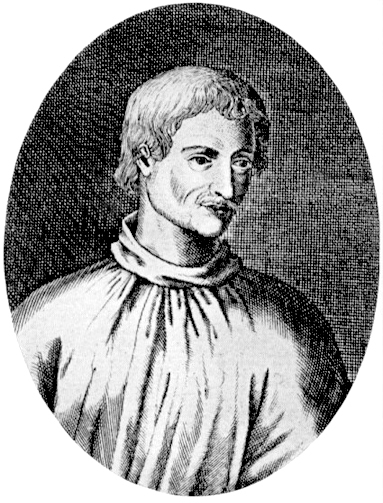 Additional evidence of Giordano Bruno’s youth is its spectacular ray system: because micrometeorites constantly rain down, they kick up enough dust to quickly (in geological terms) erode a ray system, so it can be reasonably hypothesized that Giordano Bruno was formed during the span of human history, perhaps in June 1178. However, the question of the crater’s age is not that simple. The impact creating the 22-km-wide crater would have kicked up 10 million tons of debris, triggering a week-long, blizzard-like meteor storm on Earth – yet no accounts of such a noteworthy storm of unprecedented intensity are found in any known historical records, including the European, Chinese, Arabic, Japanese and Korean astronomical archives. This discrepancy is a major objection to the theory that Giordano Bruno was formed at that time. This raises the question of what the monks saw. 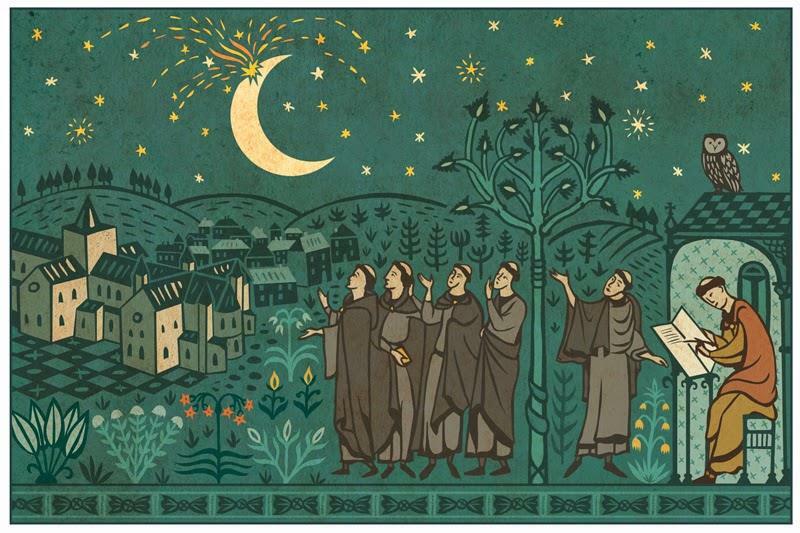 An alternative theory holds that the monks just happened to be in the right place at the right time to see an exploding meteor coming at them and aligned with the Moon. This would explain why the monks were the only people known to have witnessed the event; such an alignment would only be observable from a specific spot on the Earth’s surface. To celebrate the monks’ sighting, whatever it was, I give you a two-fer. First, here is a recipe for a cake that involves creating erupting craters on the moon. It looks to be lots of fun for kids and adults although it is not my kind of thing. Second, there are Chinese moon cakes. 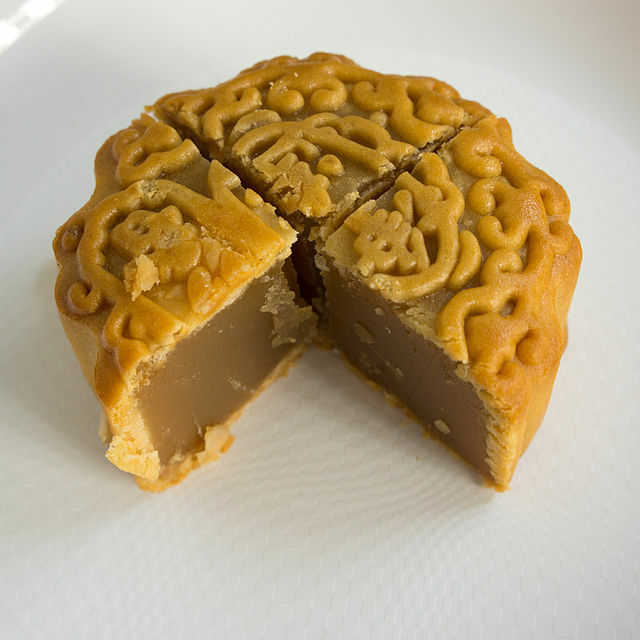 Moon cake (月饼 yuè bĭng) is a Chinese bakery product eaten during the Mid-Autumn Festival, although they can be eaten year round. The festival is traditionally for lunar worship and moon watching, although in modern times it is mostly a family holiday. 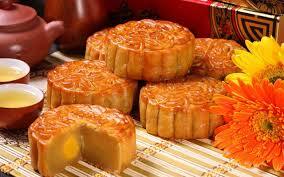 Moon cakes are offered between friends or on family gatherings while celebrating the festival. The Mid-Autumn Festival is one of the four most important Chinese festivals. 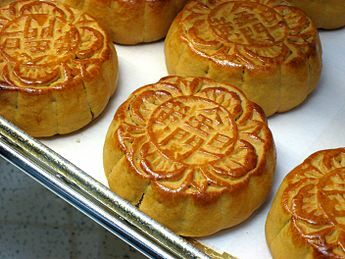 Typical moon cakes are round pastries, measuring about 10 cm in diameter and 3–4 cm thick. A rich thick filling usually made from red bean or lotus seed paste is surrounded by a thin (2–3 mm) crust and may contain whole yolks from salted duck eggs. 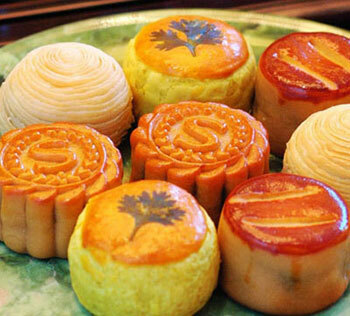 Many types of fillings can be found in traditional moon cakes according to the region. Lotus seed paste (蓮蓉, lían róng) is generally thought of as the original and most luxurious moon cake filling, but due to the high price of lotus paste, white kidney bean paste is sometimes used as a filler. Sweet bean paste (豆沙, dòu shā) made from azuki beans, is the most common worldwide, but there are also bean pastes made from mung beans, as well as black beans. Jujube paste (棗泥, zǎo ní) is sweet paste is made from the ripe fruits of the jujube (date) plant. The paste is dark red in color, a little fruity/smoky in flavor, and slightly sour in taste. Depending on the quality of the paste, jujube paste may be confused with red bean paste, which is sometimes used as a filler. The crust varies greatly from region to region as well. 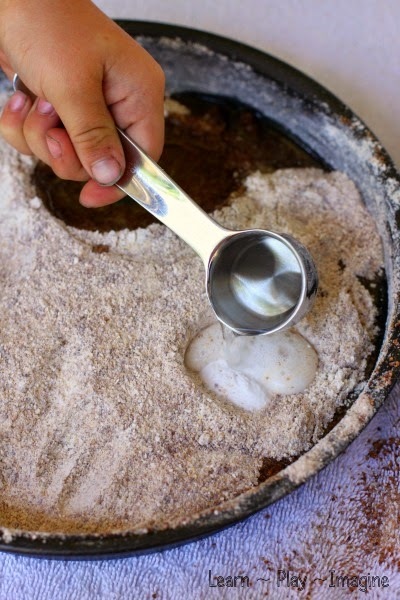 In Yunnan, where I live, the crust is made from a mix of flours including rice flour, wheat flour, and buckwheat flour. The cakes are imprinted with characters for “longevity” or “harmony”, as well as the name of the bakery and the filling inside. Imprints of the moon, the Lady Chang’e (moon goddess) on the moon, flowers, vines, or a rabbit (symbol of the moon) may surround the characters for additional decoration. Usually you eat them in wedges with green tea or a favorite. Pu-er is the normal tea drunk here in Yunnan.